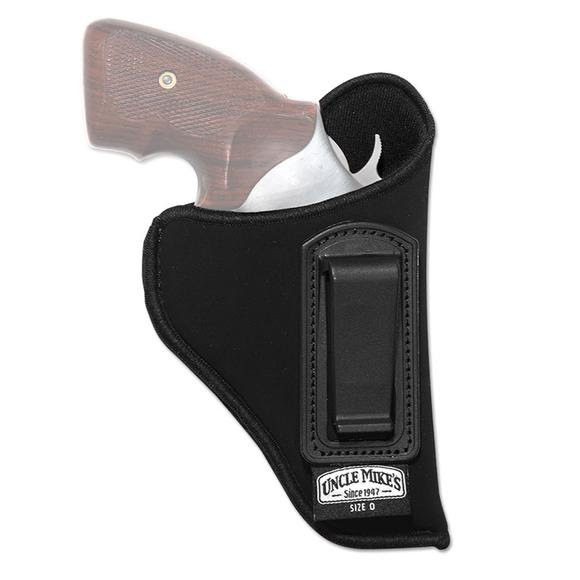 Uncle Mike's has the solution to comfortable concealed carry with their Inside-The-Pant Holster, a secure, moisture proof and compact way to keep your firearm readily available and out of sight. Uncle Mike&apos;s has the solution to comfortable concealed carry with their Inside-The-Pant Holster, a secure, moisture proof and compact way to keep your firearm readily available and out of sight. Size 5 Fits 4.5” - 5” barrel large automatics. Ultra-thin four-layer laminate no thicker than conventional suede leather holsters. Internal moisture barrier won&apos;t transmit perspiration to gun. Smooth nylon lining for easy draw. Suede-like exterior helps anchor holster inside pants or skirt.